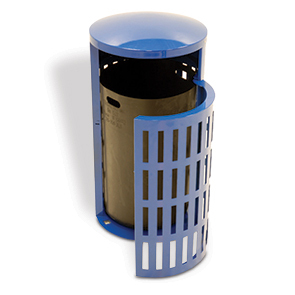 Keep public areas neat and inviting with these precision detailed 41 gallon steel receptacles that feature a large side waste disposal opening that actively welcomes people to properly dispose of litter. The one piece design of the steel receptacle has a bold laser cut pattern, slight dome top and features a hinged, side-access door. The convenient locking side access door provides ergonomic slide in and out servicing of the included rigid polyethylene liner. 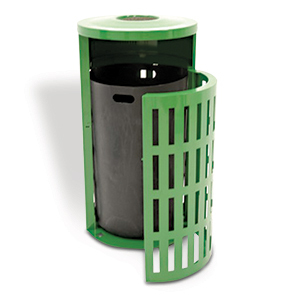 Manufactured with hot rolled steel and finished with a top-of-the-line weather and vandal resistant powder-coating that protects the receptacle from rust, corrosion and fading. These are built ready for everyday indoor or outdoor use.